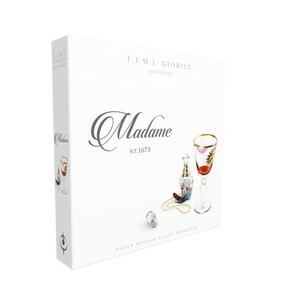 Madame is the ninth scenario for T.I.M.E Stories and promises to shake things up. The Agents of Time are sent to solve a case in 1673 at the court of the Sun King aka Louis XIV and his castle of Versailles. With Court intrigue, politics and romance. The scenario is based on real facts. Events, facts, characters make an immersive adventure in the time of the court of the king. Unlike the previous 8 official scenarios, when a run / game is "lost", you do not need to start from the beginning, you can discover another place and even use a new "Receptacle" aka character. At each new run, you choose a new receptacle for the current run, according to his skills. Receptacles you discover and unlock during the game. It will re-use the body-hopping mechanic from Under the Mask. Madam is very, technical. Certainly the most technical and demanding of the nine scenarios. You must have the T.I.M.E. Stories base box to play this scenario.